“ Most folks can do most things if they’ve a mind. Ever feel you are living the wrong life? Do you like tinned pineapple chunks? His quest to live his should-be life. It Begins: In the sterile apartment of a city executive with unruly nasal hair where the Purple-Bellied Parrot cannot even do the very thing he was born to do. the bonds of friendship — to the limit. 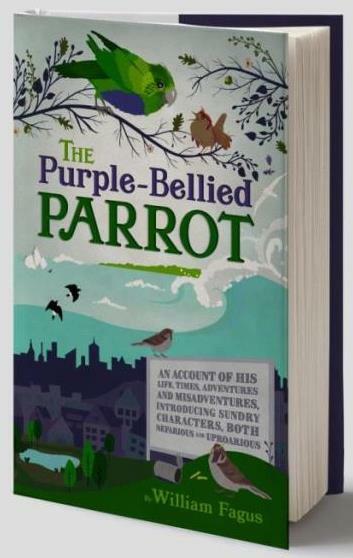 The Purple-Bellied Parrot is a spell-binding, life-affirming tale, with the power to evoke laughter and tears from readers 11-100 years old. And don’t forget to click/check the footnotes! Parental Advisory: Contains occasional mild imprecations like a*s* and bo***cks. *Badhbh: Mythical Irish bird which creates fear and confusion amongst its enemies. ‘A subtle yet poignant insight into the human condition, astutely observed from the viewpoint of a load of talking animals ...	What is going off?’ - Mrs Lush, William Fagus’s cleaning lady. I know William Fagus and he is too unassuming to ask you to do this and in any case he thinks folks will magically find his book never mind all the millions there are out there, so muggins here is asking for him. If you read this book and you like it, please leave a review. You don’t have to write loads. Apparently it helps the ‘bots’ (whatever they are) to find it and it gives new authors a leg-up and that. All written material on this website is © 2018 & 2019, William Fagus.